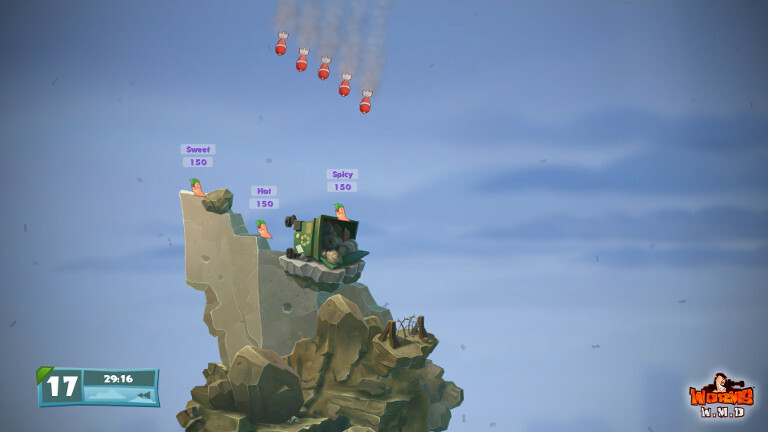 The latest release in Team17’s long-running strategy series, Worms WMD pits teams of worms brimming with ‘tude against each other in no-holds-barred battles to the death. 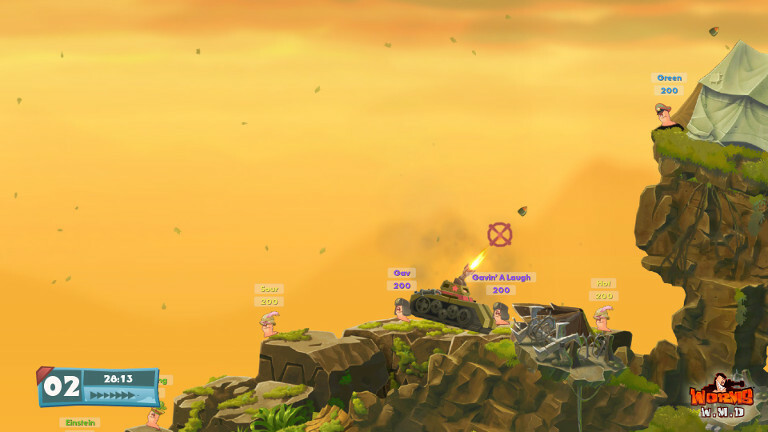 Using an arsenal of more than 80 weapons ranging from baseball bats to nukes, the worms battle for control of maps in explosive turn-based combat. There have been 25 Worms games released since the original Worms debuted in 1995, with the last few focused on mobile platforms, new gameplay directions and 3D presentations. 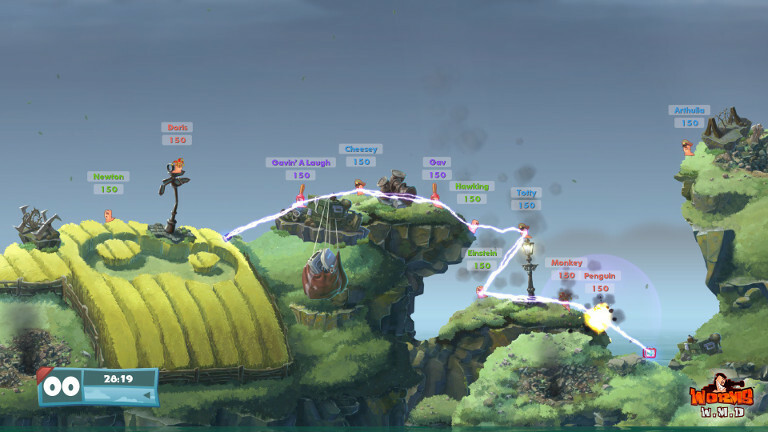 Worms WMD marks a very conscious effort by Team17 to return the series to it’s strategic roots. Indeed, WMD is most comparable to 1999’s Worms Armageddon, featuring a similar 2D side-scrolling presentation with a hand-crafted, vivid visual treatment that simply fits the zany worm vs worm warfare. The level of destruction, however, is raised considerably with the debut of a slew of new weapons, vehicles and tactics you can use on the battlefield. You’ll need to direct your team of up to eight worms to victory by obliterating all opposition all from the map by doing things like dropping the classic Concrete Donkey on a group of worms’ heads or dropping the Holy Hand Grenade in their midst. New weapons include the Dodgy Phone Battery, Unwanted Present and OMG Strike. Simply choosing which of the delightfully dangerous weapons to use can be one of the game’s most challenging aspects. Each turn consists of a limited amount of time that you must use efficiently to move your worm, select its weapon and then aim, fire and sit back and watch the fireworks. You’ll find various weapon emplacements scattered about the maps that you can use as well. And, there’s not more idle waiting time while your opponents make their moves. Now you can make use this time to make use of crafting crates discovered on the battlefield to construct even more deadly versions of weapons to unleash on your unsuspecting foe during your next turn. Other new features include the ability to take cover in buildings and hop in tanks and helicopters to take out the enemy. You will laugh out loud at the new and creative ways you come up with to take your opponents out, as well as the trash talking the worms hurl at each other during each turn and the witty tombstones the fallen leave behind. Speaking of which, as you play you earn experience that is used to unlock new taunts, costumes and tombstone markers that will keep the games fresh for a long, long time. 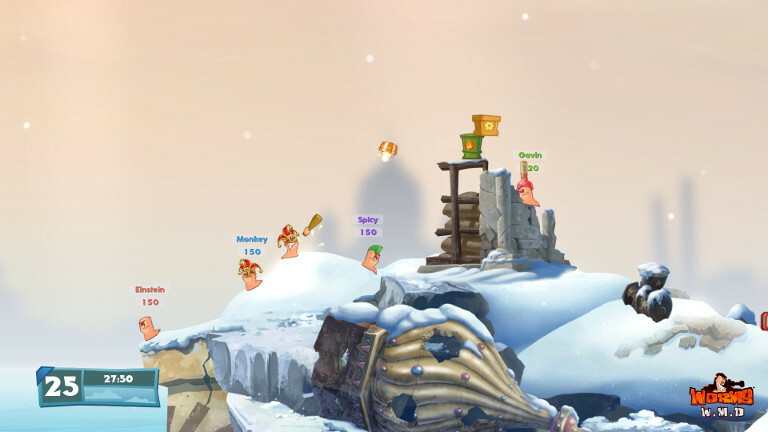 Worms WMD is great fun for the entire family - I can say this from personal experience as it remains the one and only game series my wife will play (and she’s quite good at it!) and that appeals to my teenage kids. 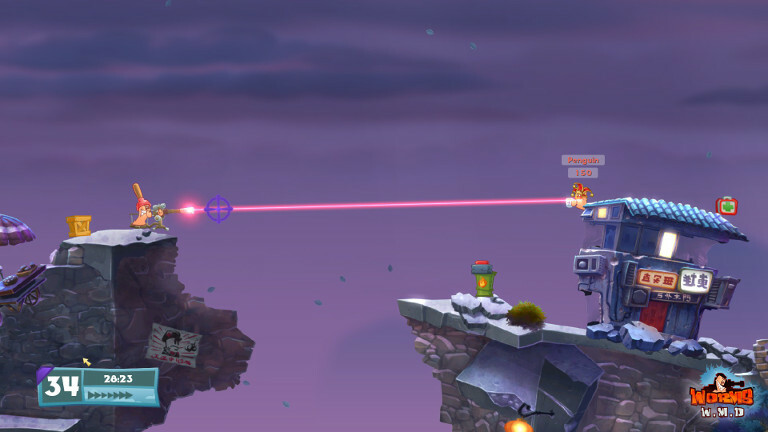 Worms WMD is available in the GeForce NOW store for $20.09, which is 33% off the regular price of $29.99. This price is good through April 4, 2017 and includes unlimited streaming rights on SHIELD and a digital download key for Steam. The game is rated E10+ by the Entertainment Software Rating Board. To play, navigate to GeForce NOW within SHIELD Hub: Worms WMD will be in the New on GeForce NOW category. If you just picked up a new NVIDIA SHIELD TV, open the NVIDIA Games app (available on your home screen) and launch the game from the “New on GeForce NOW” category. Overcooked - Play it on SHIELD with GeForce NOW!